Sometimes a minimalist like myself needs that perfect statement piece to break up the manatony that occasionally comes with wearing monochrome. Whether it is the prefect pair of pumps, statement jewelry, or even a camel handbag from Mellow World, a California-based handbag company who specializes in creating pieces made from vegan leather, sometimes the addition of a simple accessory can take a look to the next level. This is one of your best outfits! I ADORE your style!!! Thanks, this bag is pretty amazing! 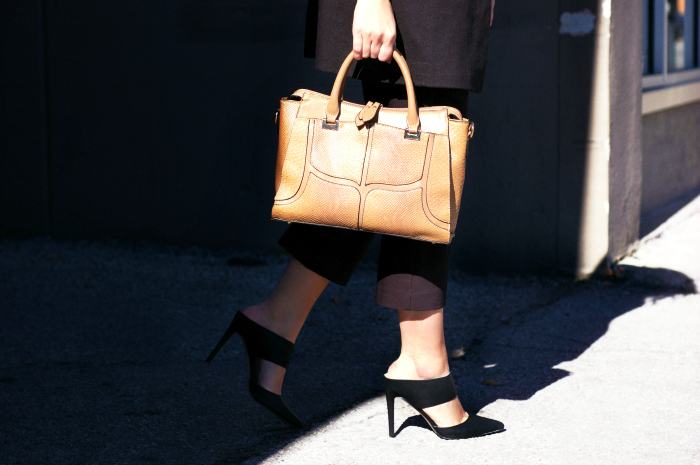 Gorgeous bag Miranda & like you say it makes a real statement against all the black. It is a really great size also… not too big, nit too small. Camel details are everything (especially this time of year). What a classy, beautiful look! Love those heels! Very chic look. Absolutely love your shoes! I love your way with words, and those mules. I know the focal point is that lovely bag but I remember noting them on Instagram and have been itching to find out where and who! Thanks! I am also a writer, so your wards make me smile!! I really love that bag and styled with all black makes it pop even more! ok, I NEED those sandals!!!! Yes! Great minds think alike. Thanks! I will go check it out! Oh the mules!!! They are so much like the Miu Miu ones, are the comfortable, and true to size? The camel and black is such a nice colour combination 🙂 Lovely blazer on you too!